My new design is still that… a design. But progress IS being made! I did make the prototype cut… a fancy way of saying that I have cut it out of poster board! My designs fit together like a puzzle, and I am very picky about them fitting together perfectly. When I first started making these for myself, I was cutting them out of the fabric with the fusible on the back, and then finding something I wasn’t happy with, and starting over. I was raised by the “Waste not, Want not” rule and that was not acceptable to me, not to mention that it gets expensive! Do you know that fusible is more expensive per square inch than good batik quilt fabric? And I was throwing both away!?!?! So I started trying to figure out a better way. One day it clicked that poster board is cheap, relative to fabric with fusible, and works well to assemble a puzzle. I have a pretty good grasp on how thin an area can be cut from fabric and still not fall apart when handled, so I can tell that the poster board as well. So now the process is to cut the design out of poster board and work the puzzle. 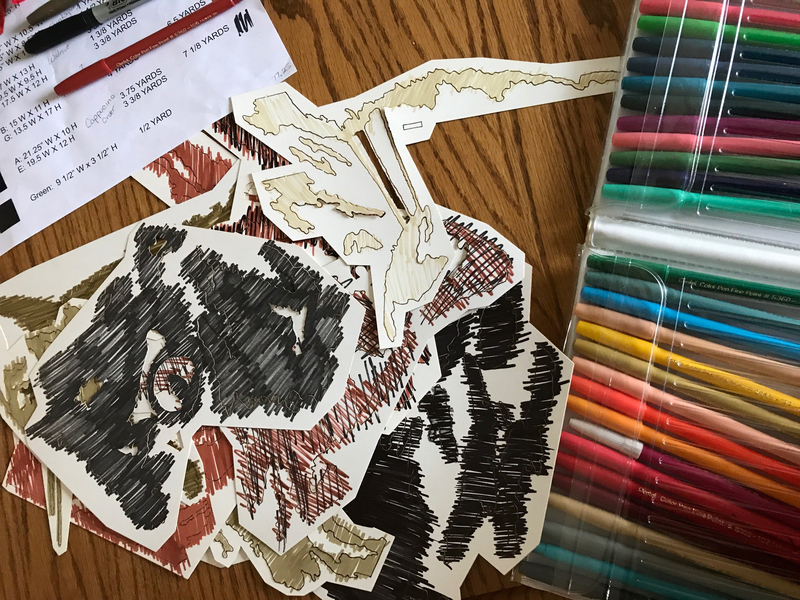 I also quickly color the pieces with marker, just so it doesn’t get too confusing looking at a pile of white puzzle pieces. The colors aren’t always right, but they do the job! So, the puzzle is made, the fabric ordered, AND I get a backorder notice. Grrr… but only until I could wrap my mind around it. Okay, move forward and start the assembly instructions. These take a LONG time to write, and I usually do them after making the initial kit to photograph, but I am too excited about this kit and don’t want to have to wait! So now the instructions are written, and hopefully ready to go. And I think this is going to change the order of my process! While writing the instructions, I changed the order of a few pieces, as I “built” the kit on the computer. This saved some back and forth in the assembly and simplified a few things. I even eliminated a couple of pieces (this kit has a LOT of pieces!) that just did not seem necessary in light of my fabric choices. I was able to change the cut files to match, eliminating even more steps. So much better! So once again, what started as frustration, turned into learning a better more efficient process. Bring on the fabric, please!!! Are you frustrated with a project? Take a deep breath and move forward with what you can!